When MRW was first published 100 years ago, few developments in the Far East would have registered on the UK’s waste sector. How different today in the week in which outgoing Chinese premier Hu Jintao told the Communist Party Congress that there had to be a fundamental shift in the uses of resources and a transformation in his country’s energy efficiency. “We will have a large-scale circular economy and considerably increase the proportion of renewable energy sources,” he told delegates. A greater emphasis on home-grown solutions involving secondary materials must surely follow as he promised to “speed up the formation of systems and mechanisms for sustainable development”. There was also a timely report in The Daily Telegraph at the weekend quoting Environment Agency data that 17 containers from the UK have been turned back from China this year because they contained low-grade, contaminated plastic material. This ‘quality’ trend is one that MRW has been reporting regularly during 2012 but, taken together, these two developments indicate the twin challenge facing our exporters: lower demand from China and higher quality standards. Last week, I wrote about editor Emma Maier’s maternity leave kicking in (pun intended). This week we also bid farewell to features editor Katie Coyne for the same reason. 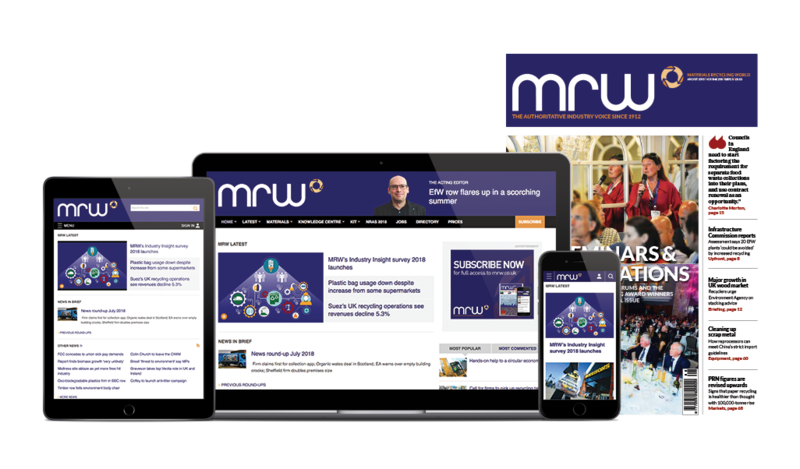 The baton for organising future kit and feature pages in MRW is passing to Greg Pitcher who can best be contacted by email: greg.pitcher@emap.com. And don’t forget our telephone numbers have now changed. If the number you are calling does not start 020 3033, you won’t get through. Our new numbers are here.